Rayman Legends is a sonically superior, visually vibrant and preposterously polished platform game. Heck it blows away almost every platformer on any platform in recent memory. It looks incredible, sometimes unbelievably so. It sounds sublime and has the complete package that just keeps on giving. Rayman Legends is superb. No need to read on further unless you’re, quite frankly, crazy. 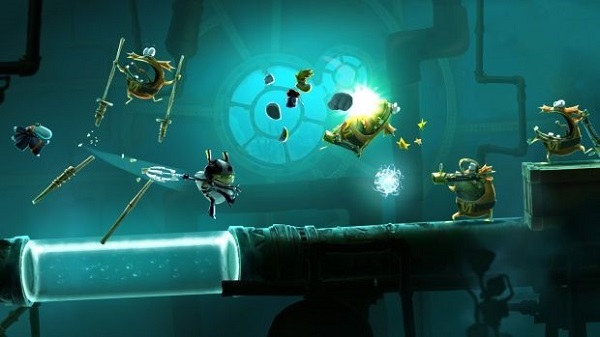 Unlike so many people with Rayman Origins back in 2011, you need to get out now and buy it. Still reading? You my friend might be crazy but at least I have someone to tell just how well Ubisoft have handled this sequel. Originally destined for the Wii U only I first got my hands on the game around a year ago at Eurogamer Expo. It was, by far, the best game on display at the show on the Wii U – the included first party Nintendo products too! Then the world went dark around Rayman Legends, people dropped the Wii U like a Best of Rolf Harris DVD and I feared Rayman Legends would be cast aside. Luckily Ubisoft came through and opened the game up to multiple platforms. 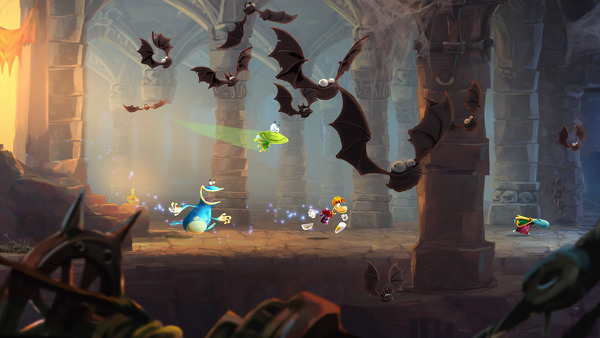 Rayman Legends threads a very thin story, much like its predecessor. This time you have to navigate 5 worlds to defeat the five Dark Teensies who are holding the other lovely Teensies captive. All this just serves as backdrop for the worlds you’ll be visiting and as such can be largely ignored. Rayman, Globox and the growing team of allies are here to save the day. Platforming action in Rayman Legends remains mostly unchanged from the original outing. This is an excellent thing as the original had the controls, weight, inertia and precision down almost to perfection. You’re handed a much larger selection of worlds right off the bat in Legends and this is a small but clever step forward by the Ubisoft Montreal team. It allows you to tackle areas in the pattern you see fit and never hems you in to a set of levels with the need to complete them before seeing something new. 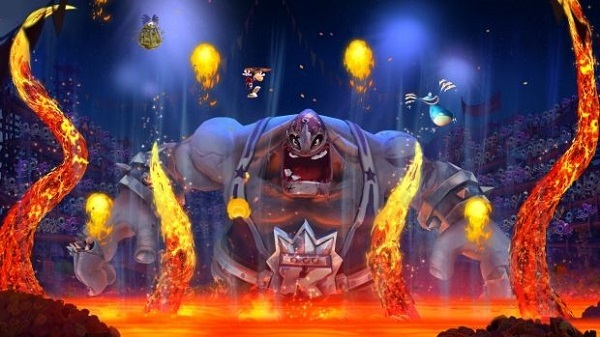 Talking of something new Rayman Legends has dispensed with the original games Mosquito flight end of world games and replaced them with boss battles. These battles are a little formulaic, but fun enough. I do pine for those shooting sections though. Talking of additions there have been several play styles added to the mix in Rayman Legends to break up the relentless platforming action. These could be in the form of a basic shooter using Rayman’s magically gloved fists, a stealth section, some wonderfully inspired musical rhythm levels to the Wii U inspired Murfy levels. The Murfy levels are the ones that really caught my attention last year. These levels used the Wii U tablet controller and allowed a seconds player to interact with your game. They could cut ropes to open up safe passage for Rayman, stop fire jets long enough to get Rayman across sections or even tilt and manipulate the level around an axis. These levels are still in evidence in the non-Wii U versions but they don’t play anything like they once did – in some instances they serve to hamper the later game. For example, on the Wii U edition Rayman will enter a room and grab hold of a ring. The ring is on a large wheel of spiked with the exit at the other side of this rat maze like wheel of spikes. Player 2 then twists and turns the Wii U pad to manipulate the spiked wheel and player 1 drops and grabs their way through. It’s a wonderful bit of teamwork play and works so, so well in practice. On the controller based consoles you simple move the wheel yourself as Murfy flies to key spots. Same with the other level manipulations. On the touch screen controller you slice and press your way through a level – on the standard controller you simply press a button when Murfy flies to the spot. It feels like an odd hangover – it also cries out for Vita/Smart Glass/Smartphone integration! It also becomes frustrating to time it all in later levels where precision is key. It takes a whole lot to amaze on the graphical front these days. Billions of polygons, hours of painstaking texture work, meticulous scene creation and rendering and a 101 post processing effects will just about get you a “meh… looks OK”. Rayman Legends will blow you away graphically. Origins looked great, it highlighted a wonderful art style and showed what the UbiArt engine could muster. Rayman Origins takes that, shines it until your eyeballs bleed and then takes it one step further. As with Origins the artwork is superb. So bright and colourful but with a unique brush stroke and palette that just really shines. Animation is ridiculously well accomplished with characters moving fluidly and with a style all of their own. This is the pinnacle of 2D animation in gaming – heck it’d give any medium a run for its money! The same lavish care and attention has been given to the audio as well. Once again Rayman Origins was no slouch in this area with the music being one of the things that won me over. Rayman Legends works this further still with super catchy ditties ad level music and the wonderfully reworked bonus music rhythm stages (no spoilers but Black Betty features in one!). Once again Ubisoft Montreal outdoes the competition it themselves. At around 6′ish hours to run through the stages on offer some might level a criticism of longevity at Rayman Legends. Once you factor in that the game can be played co-operatively, there are multiple things to unlock and many hidden treasures to find you soon see the value of the title in a whole new light. Add to that the inclusion of the new Creatures too (you collect various creature cards and then these wee beasties will give you a Lums bonus each day!) and the ability to unlock old Origins levels and the game just keeps on giving and giving. If any criticisms can be levelled at the game, it can be that it has times of needless frustration. Certain situations require a level of clairvoyance to see a trap about to materialise on your path. Sure, once you’ve fallen in to said trap you know for next time but it feels a little cheap and beneath the game. Other sections can require a god-like mastery of the analogue stick – we’re talking pixel perfect in a literal sense. Again, this is down to player skill but it will frustrate many and exclude some. I once described Rayman Origins as “.. a game that wraps you in a warm blanket of quirky humour and heart-melting action.” And I can think of nothing more fitting for its sequel. From the moment you start the game, to the moment you realise it’s 4am and you have to be up in 3 hours, you will be enveloped in a euphoric gaming experience that has little equal. A game the fires on all cylinders to the point of approaching perfection in its chosen field. I always looked back and regretted not handing its older sibling a perfect score, I won’t be making the same mistake with Rayman Legends. You simply can’t get a better platformer for your money – and yes that includes lazy plumbers and their lanky brother.